But What Does it All Mean Man? : It’s not Easy Being Non-green – What can a State do to Keep the Green Tide From Its Neighbors at Bay? Last time, we talked about how Nebraska and Oklahoma (or the NO states) were suing the State of Colorado in an effort to have the federal government help them keep the green tide from Colorado at bay. We also talked about CARERS, which, if Colorado switched to an expansive medical market, would make the NO lawsuit moot. This time, we will engage in a thought experiment. For this post, assume that CARERS has passed and medical marijuana is federally legal in any state with any medical-regulation scheme. Remember, CARERS is only concerned with medical marijuana, not recreational. What remedies would the NO states have left? Is this what the future border crossing on I-76 between Colorado and Nebraska would look like? Would a US-Mexico style crossing between states even be legal? To help, lets consider some fantastical states. We will start with a state based on the subject of this blog – New California. New California, like California, has very broad medical regulations where almost anyone can get a medical marijuana card. Recreational use of marijuana is not legal in New California. Next we have New Georgia. Like New California, New Georgia does not have legal recreational marijuana. However, it has a very limited legal medical marijuana regulatory scheme. In New Georgia, only patients with serious medical conditions like Parkinson’s and cancer can get access to CBD oils. New Colorado has both medicinal and recreational marijuana. Its medical scheme is nowhere near as broad as New California’s, but many people with a variety of medical conditions can still get a medical marijuana card. Everyone in New Colorado can get recreational marijuana. New Washington decided to skip out on medical marijuana and legalized only recreational marijuana. In its desire to quickly join the green wave sweeping the states, New Washington decided to totally decriminalize any production, sale, or possession of marijuana. It has no regulations of any kind. Finally, we have New Nebraska, a state opposed to any marijuana reform. New Nebraska wants to keep all marijuana illegal and is rather annoyed about people bringing marijuana from the other four states across its borders. These five states are located in such a way that each state shares a land border with New California. To further simplify things, each state has reciprocity scheme where if something is legal in two states, both states honor the other state’s authorization. For example, if a New Georgia medical marijuana client went to New California, they would be able to purchase medical marijuana and vice-versa. Given the way CARERS is currently structured, the federal government will treat any state with a medical marijuana regulation as having some degree of exemption from federal prohibition (when it comes to medical marijuana). For our hypothetical, these states are New California, New Georgia, and New Colorado. In each of these states, CARERS makes many marijuana products federally legal. In my last article, I touched briefly on the strange situation this might create in a state like Georgia. Now we are going to go more in-depth and look at the different relationships created amongst these neighboring states. There are four key relationships: Medically Regulated to Medically Regulated, Medically Regulated to Medically & Recreationally Regulated, Medically Regulated to Recreationally Regulated, and Medically Regulated to Prohibited. Both New California and New Georgia will receive some benefit from this, but to varying degrees. In New California, where anything goes, pretty much everything will be federally legal. This results in a clear rule without many places for hiccups in enforcement – the feds will have no authority. New Georgia will have marijuana legalized to the extent that the state has, which creates major enforcement issues. While possession for use might be simple, consider production. If New Georgia has a complex regulatory framework for the process of CBD oil production, simply violating one scintilla of state law will result in violating the CARERS exemption. This could result in federal criminal charges for acts that might be mere license violations at the state level. Let’s turn to the border between New California and New Georgia. CARERS suggests that so long as you follow state rules, you are exempt from federal marijuana law. This leads to the question – can you then take marijuana that is legal in both states across the state border? The answer seems to be yes. At no point during the drive from New California to New Georgia does the marijuana become illegal. Except it’s not that simple. While CBD oils would be federally legal to transport across the border, a cloned plant wouldn’t be. Will state and federal agencies at the border have to police for plants, but not oil? That sounds like a mess. Unfortunately, New California to New Georgia isn’t the messiest border. That title belongs to New California and New Colorado, or Medically Regulated to Medically & Recreationally Regulated. In addition to having all the complexities regarding the nuanced differences in their medical schemes, New Colorado also has legalized recreational marijuana. The exact same product bought for medical purposes in New California could be federally illegal if bought for recreational purposes in New Colorado. This would be impossible to police. Even in a world without the Fourth Amendment – one where police searched each car on a state border—it would be impossible for the police to distinguish what was bought for a recreational purpose and what was bought for a medical purpose. In fact, a New California resident could buy their medical marijuana of choice in New California, drive it to New Colorado and have it be totally legal. However, when coming back, if they purchased the exact same product at a recreational store in New Colorado, the New California resident would violate federal law. I want to take a moment to appreciate the implications of marijuana being federally legal in a state with an international border. This may be even more complex. This is a fascinating topic, is governed by treaties, and warrants further research and discussion. We won’t be doing that in this post. Our last two borders are the simplest. Despite appearing on opposite spectrums of liberalization of marijuana policy, CARERS treats New Washington the same as New Nebraska. As neither state has medical regulation, CARERS doesn’t change much. Any New California medical marijuana will become federally illegal the second it crosses into New Nebraska or New Washington. New Washington recreational marijuana would always be illegal, and so would be federally illegal in both states. Finally, let’s consider our prohibitionist holdout state, New Nebraska. While New California and New Colorado might decide not to enforce the laws broken at their borders by the nuanced differences in their laws, New Nebraska wants none of the green tide spilling into its border. So what can New Nebraska do to keep it at bay? There are some legal principles at work here: state borders are different than international borders, and Article 1 § 8 of the U.S. Constitution states that commerce between states is a federal matter. A state can’t decide to outlaw a widely used type of truck on its roads in an effort discourage to truckers from driving through the state. A state’s power to police its border is not limitless – if the state’s actions are found to be too large of a burden on interstate commerce, they can be overturned. Let’s consider what possible options New Nebraska might have to keep illegal marijuana from flowing across their border with New California. A drastic (and illegal) solution would be to close the border. Another solution would be to create a regulatory scheme for medical marijuana, but if that were a viable option, New Nebraska would not be concerned with the green tide. 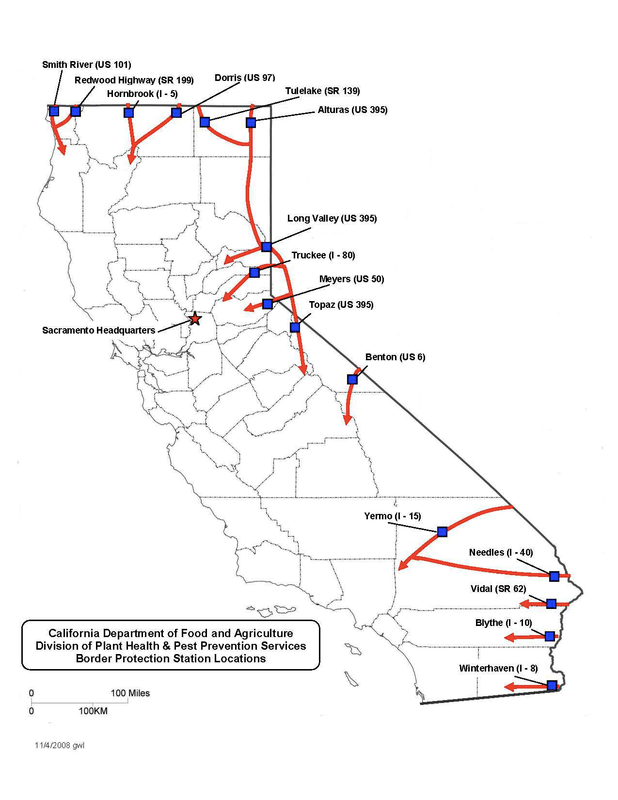 Current California State Run Border Protection Stations. CA Dept. Food & Ag. 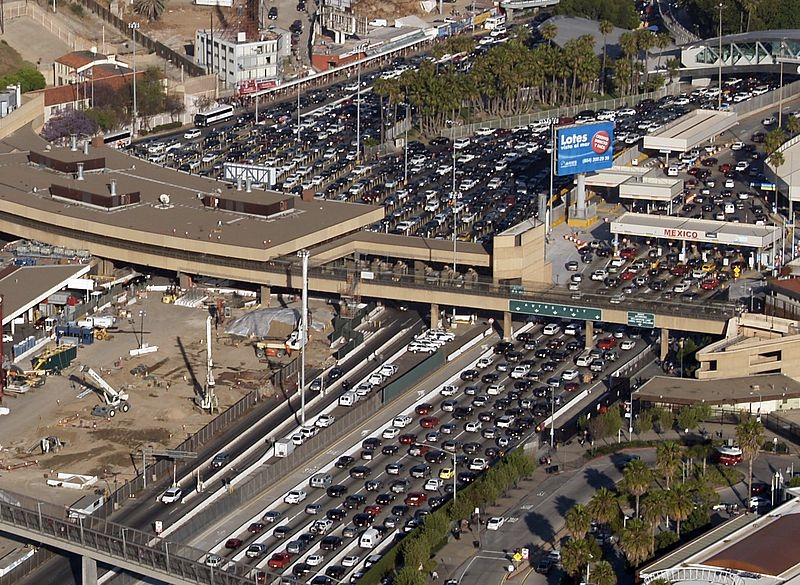 Just as California has border stations along its highway connections with other states, New Nebraska could create stations like this at its border. This plan raises two questions: Who would pay for these stations and does New Nebraska have any authority to search for marijuana at its border? At first, it’s almost certain that New Nebraska would have to pay for increased border security. However, they could ask the federal government for reimbursement, or sue New California or New Colorado for money damages equal to the cost of increased enforcement. There is no precedent for this, because there is no precedent for something becoming federally illegal simply by crossing a border. This is distinct from something like a radar detector – which is a legal article of interstate commerce, but illegal in some states. At no point does a radar detector become federally illegal by crossing a border. The closest analogue is environmental lawsuits between states. Back in 1906, Missouri sued Illinois for polluting tributaries of the Mississippi River and contaminating its drinking water. The court noted that congress had not prohibited Illinois’s actions – making the distinction between New California’s 100% legal scheme and New Washington’s 100% illegal scheme nonexistent. While this lawsuit was dismissed because Missouri was dumping similar pollutants into the river as Illinois, it outlines a possible format that a state could seek to apply for the cost of setting up increased enforcement to keep the green tide at bay. A plaintiff would need to show that the harm was stemming from the defendant and the increased damage to the plaintiff state was caused by the defendant’s action. But would these enforcement stations have any legal ground to search everyone’s cars? Surely California’s border stations can ask you if you are transporting produce into the state, but asking is very different than searching. The Fourth Amendment prohibits unreasonable searches and seizures without warrant or probable cause. In Indianapolis v. Edmonds, the US Supreme Court found that it violated the Fourth Amendment for the City of Indianapolis to conduct drug interdiction checkpoints. The bottom line seems to be: police can’t search without probable cause. However, there is a legal principle that our international borders are different in regard to the Fourth Amendment. In effect, the Fourth Amendment is weaker in San Diego than in Denver. Could this principle apply to a state border? The fact is, we don’t know. There’s another wrinkle in this: the odor of marijuana is frequently used as probable cause for a search. This might change in on the New California side of the border, but not on the New Nebraska side. New Nebraska could probably pull over everyone committing any vehicle code violation at the border and take a deep breath as they approached the driver’s side window, but not much more. It’s hard to imagine that this would be effective. Where does that leave us? Marijuana reform is currently a mess. CARERS would do little to alleviate that, but would substantially change the landscape. A state in a post-CARERS world might have no effective challenge to stop the green tide emanating from its neighboring states. Certainty, this is not sustainable – either all the states will have to accept marijuana within their borders, or something different will have to be done federally. However, even if all the states enact a medical reform, unless each reform is identical, marijuana will still drift into grey areas of legality, especially on state borders. Next time, we will talk about how that might work, and look specifically at the future of medical marijuana in California.